The Trust continues its bid to make one in five of its wards dementia friendly as it opens its second newly refurbished ward in as many months. Sandwell and West Birmingham Hospitals NHS Trust are to open the fully kitted out ward D26 at City Hospital for use tomorrow (Friday 20 December). This follows the opening of revamped D11 in November. The ward comes complete with a purpose-built lounge area, dining area and, like D11, a cinema room. Alongside this, the ward has been fitted with homely wood-effect flooring and new lighting and the ceiling tiles have been replaced. Joy Walker, Senior Ward Sister, said: “The ward has a welcome approach. Patients will see the colours and how sociable the ward is and it will help to make them feel at home. 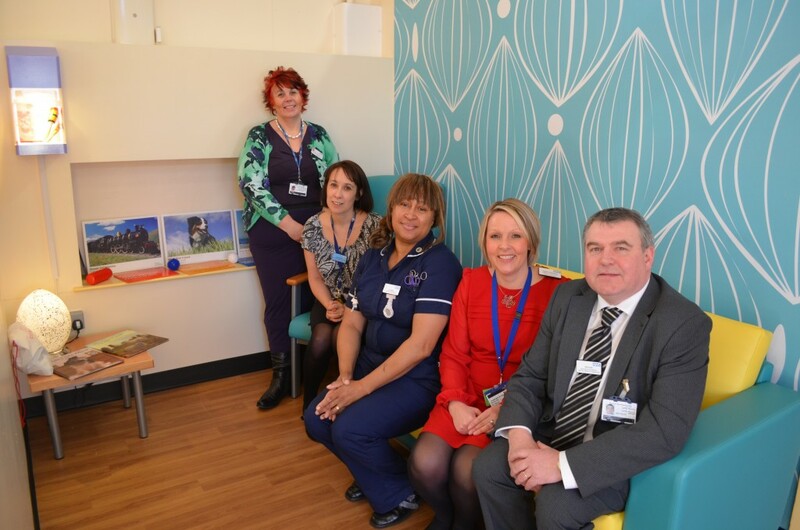 Estelle Greenwood, Patient Experience Project Facilitator, said: “We have included a new lounge area with a sofa, low lighting and memory library, where patients can sit in the evening, and it has patterned wallpaper to help create a calming environment for patients. The dining area comes complete with new tables and chairs so that patients can sit and have meals with friends and relatives who visit the ward. The bathrooms have also been fitted with new showers, splashback screens and flooring to offer a contrast for dementia patients. There are two new nurses’ stations for both ends of the wards, making it easier for relatives and patients to locate ward staff. They even allow for patients to go and sit with nurses at the station if they wish. The entire ward has been decorated with the most up-to-date specification and colour schemes in line with dementia purposes and is divided into the four seasons, so that patients feel familiarity on different wards. The improvements to D11 and D26 were funded as part of a £900,000 grant from the Department of Health to make ward areas more accessible for patients with dementia. These improvements are part of the Trust’s wider commitment to being “dementia friendly”, which includes equipping staff with the knowledge and skills to care for patients with dementia in the best possible way.